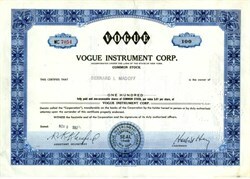 Beautifully engraved certificate from the Vogue Instrument Corp. issued in 1967. This historic document was printed by Haserouck-Thistle & Company and has an ornate border around it with the company name on top center. This item is hand signed by the Company's Chairman and Secretary and is over 51 years old. This certificate is issued to and signed on the verso by Bernard L Madoff. 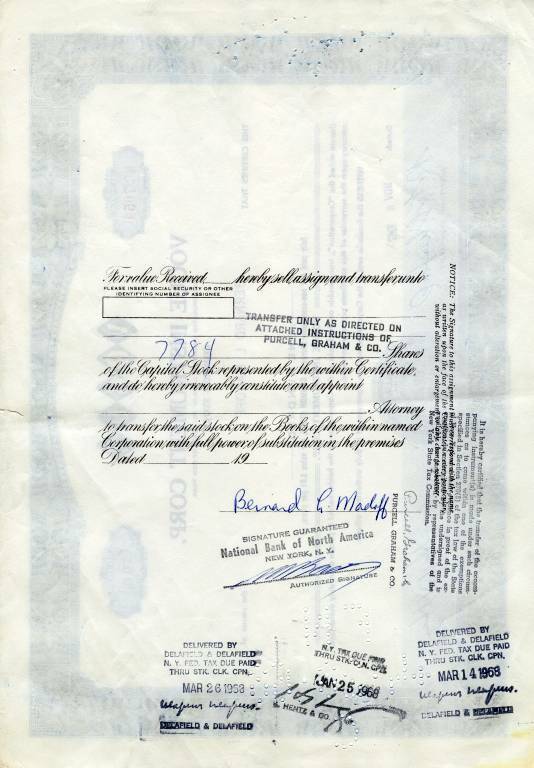 We have only seen on other certificate issued to and signed on the verso by Bernard L Madoff. This certificate was most recently on loan and displayed prominently at the Museum of American Finance in New York during the past 4 years. Bernard Lawrence "Bernie" Madoff (born April 29, 1938) is an American fraudster and a former stockbroker, investment advisor, and financier. He is the former non-executive chairman of the NASDAQ stock market,and the admitted operator of a Ponzi scheme that is considered the largest financial fraud in U.S. history. Prosecutors estimated the size of the fraud to be $64.8 billion, based on the amounts in the accounts of Madoff's 4,800 clients as of November 30, 2008. Madoff founded the Wall Street firm Bernard L. Madoff Investment Securities LLC in 1960, and was its chairman until his arrest on December 11, 2008. The firm was one of the top market maker businesses on Wall Street, which bypassed "specialist" firms by directly executing orders over the counter from retail brokers. At the firm, he employed his brother Peter as senior managing director and chief compliance officer, Peter's daughter Shana Madoff, as the firm's rules and compliance officer and attorney, and his sons Andrew and Mark. Peter has since been sentenced to 10 years in prison and Mark committed suicide by hanging exactly two years after his father's arrest. Andrew died of lymphoma on September 3, 2014. On March 12, 2009, Madoff pleaded guilty to 11 federal felonies and admitted to turning his wealth management business into a massive Ponzi scheme. The Madoff investment scandal defrauded thousands of investors of billions of dollars. Madoff said he began the Ponzi scheme in the early 1990s. However, federal investigators believe the fraud began as early as the mid-1980s and may have begun as far back as the 1970s.Those charged with recovering the missing money believe the investment operation may never have been legitimate. The amount missing from client accounts, including fabricated gains, was almost $65 billion. The Securities Investor Protection Corporation (SIPC) trustee estimated actual losses to investors of $18 billion. On June 29, 2009, Madoff was sentenced to 150 years in prison, the maximum allowed.